Saleen "Widow Maker" Unveiled As "Dark Horse"
Willow Springs International Raceway, Rosamond, CA -- September 24, 2008 -- by SOEC/Saleen Forums News -- Saleen CEO Chris Theodore officially presented its latest limited edition Mustang on the grounds of the fastes track in the west. “Dark Horse is the meanest, darkest and fastest Saleen yet,” said Theodore, who only last month took over the top position at the automaker and shifting gears from the job of chief technical officer. The Dark Horse powerplant is SAE-rated at 620 horsepower with 600 foot-pounds of torque, though it gets a little boost from Speedlab's SuperShaker supplying exclusive styling while enhancing performance. “The vehicle takes advantage of the ram effect into the SuperShaker air box,” states Dan Agnew, Powertrain Engineering Manager, “It increases pressure in the air box, which adds boost by 0.5 psi and holds air charge temperature relatively constant even with the higher boost.” The Dark Horse powertrain also features a Saleen port-matched Series VI integrated screw-type supercharger, forged aluminum pistons, forged steel connecting rods, and orged steel crankshaft. While the SAE-certified horsepower rating does not necessarily reflect the full benefits of the SuperShaker, it does exhibit itself on the track with neck-wrenching acceleration. The new Dark Horse combines the power and handling of the Saleen Extreme with Heritage body stylings. Its black body color, flat black exterior graphics, blacked-out trim and black chrome wheels make up the exterior. A Ford navigation system, sport leather seating with Alcantara inserts, and red anodized shift gate and leather-wrapped shifter are featured in the cockpit. “The Dark Horse provides the capability of extreme horsepower and provides the detailed look our customers expect. By merging the SuperShaker with the Extreme powertrain we have created a no compromise solution for people looking for both performance and classic Mustang looks,” states Marc Musial, Chief Powertrain Engineer. The Dark Horse's suspension features everything you would expect from a Saleen, including a second generation Watts-link. The package is impressive, and provides sure-footedness around the tight road course of the Streets of Willow at high speeds, tight turns and aggressive braking. It is considered the most intense Saleen ride yet. Originally code-named “WM” or the “Widow Maker,” the Dark Horse will be a limited edition of 25 coupes and begin production in November 2008. Pricing is to be announced, but should run in the $89,000-plus range. 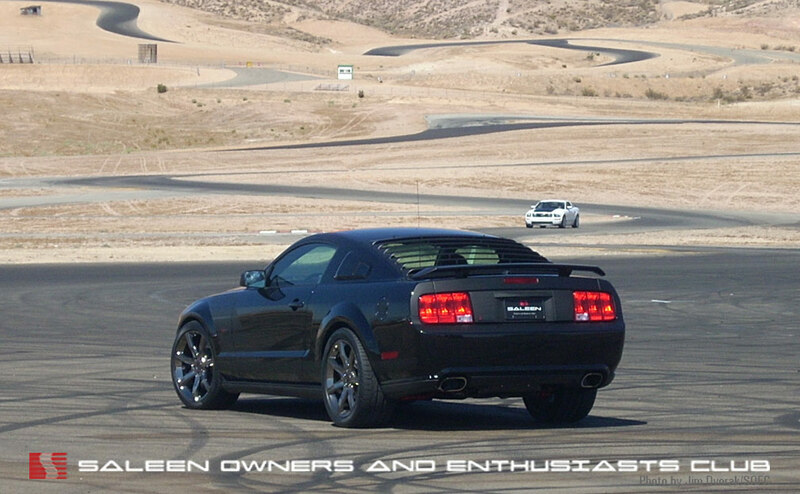 SOEC, founded in 1991, is the premiere organization for Saleen owners and enthusiasts, with thousands of members worldwide. 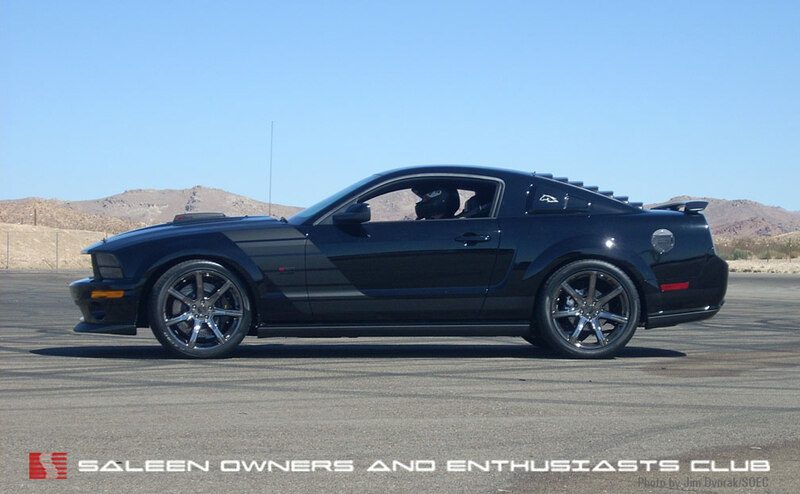 Last edited by Saleen Forums Admin; 09-25-2008 at 12:36 AM. I am new to the forum ; mid 50's and looking to purchase in the spring.In 1970 I had a new Boss 302.What model do you recommend. I do like the sc281. Not one for 2 much splash. or stripes like the PJ. thanks !! PJs are a real bargain right now... it's a favorite model of mine, and I know of several dealers that have one or more. 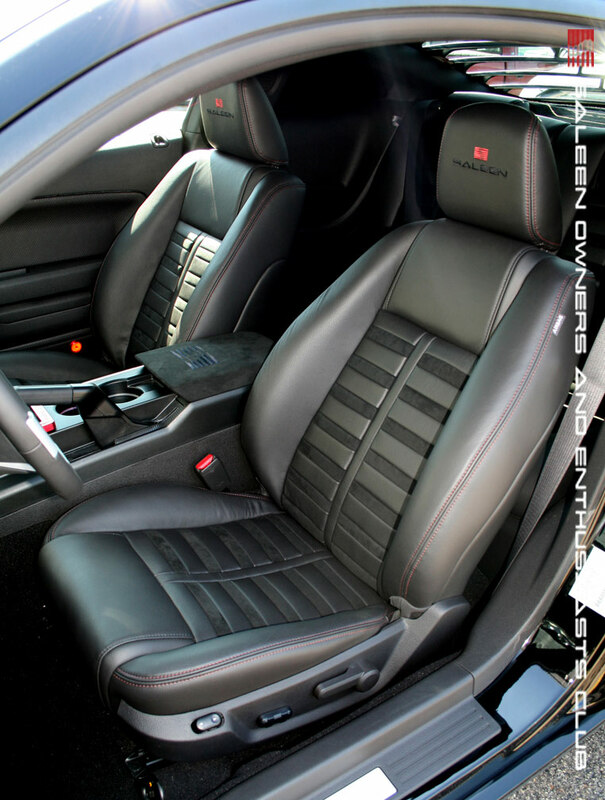 Check the classifieds and the Saleen Locating Service. But for less flash, you could go with a Heritage or a Racecraft. If you want to buy in Canada, PM me where you're at and I can probably direct you to a dealer -- they're building the dealer network in Canada quite aggressively right now. Last edited by Jim D.; 09-25-2008 at 12:43 AM. I dig the seats in the Dark Horse. The in-car video posted at Motorator is pretty neat... that's Derk Hartland, Saleen's chief chassis engineer, behind the wheel, and he's actually driving pretty conservatively during that video. Derk works with the R&D team at Saleen Irvine (now Mission Viejo), and has a lot of time on that track under his belt. He took journalists for hot laps in Dark Horse, and for me it was an E-ticket ride; pushing the limits, but still feeling very controlled. He drove aggressively and with finesse, showing there was plenty more the Dark Horse could give under the guidance of such a driving talent. Derk admitted that he was taking it easy. Even in the short straightaway, we got well over 110mph in what seemed like a flash. I'm glad I brought my helmet, but I don't believe I ever had a ride like that which felt so balanced, yet with seemingly unlimited horsepower and under total control. Derk came to the U.S. from Holland, and has worked in various capacities under Steve Saleen, and now Saleen Inc. These days, when he's not doing Saleen or Racecraft chassis tuning, he spends his "vacation time" supporting an S7R race team which runs in North America. sweeettttttttttt. what's the price tag on one of those? I take it has a '08-'09 Bullitt grill? IMO, they are getting out of control with the pricing of these cars. Sure, its a great looking car but not for $89k. I personally like the Extreme cars over this car even though they will be producing more E's then the darkhorse. They are doing less work on this edition then they do on the regular Saleens and its costing more $$$$. It just doesn't make sense to me.?.?.?.? IMO, they are getting out of control with the pricing of these cars. Sure, its a great looking car but not for $89k. I personally like the Extreme cars over this car even though they will be producing more E's then the darkhorse. I don't know. How many E's do you think they made in 2008? I'm pretty sure the 25 Sterling cars are giving the standard '08 S302 Es a run on production. They are doing less work on this edition then they do on the regular Saleens and its costing more $$$$. It just doesn't make sense to me.?.?.?.? I don't think the Dark Horse has less development or a quicker conversion process. You have to figure it's an Extreme in a Heritage wrapper. It's a built car. The only bummer I see for 2009, looks like the side airbags caused the bolstered seats to go bye-bye on the S-Line. At $89K... this Dark Horse has to fall in line with the S302 Es. You figure, I think the old base MSRP for the S281 E was about $75,000. The test with success will be if they sit at the dealers next the '08 DG editions... or if they find exciting homes with new enthusiasts. Why do you say that they sold all of the 25th cars, I have a couple of dealers who have E for over 90k. Back when you car was new everyone said it was over priced. Some say the SSC was three-times the fun of a 5-Liter LX. But yeah, those lived at the lots when the bottom fell out of the economy. I brought up the Sterling car. Correct, a few still live at dealers. Had there been a production of ten, pre-sold to customers, and named "SA-25" there would have been more demand than cars and a win-win situation. Cool car that could have used different marketing. I'm sure Wayne's seen the 2008 Speedlab Yellow S302 E on your site. Neat car. Dark Horse is probably three-times the price of a 2009 GT coupe... it continues the standard set by the SSC. The tradition continues. Once again, thanks for the photos Jim! I don't know how many they made of just E cars not including the Sterling. They might have built near the same amount but that could also have to do with some problems they had with the transmissions... One dealer had to wait over a month for one of there sterling cars because of the problem. The DG cars are just flat out ugly IMO. I have dealings with a few dealers and they don't sell at all, they are just a very expensive filing cabinet. Now the dark horse is much better looking but now you are at $90k for it. For that price I would rather have a custom paint option on an E car and have possibly 1 of 1 compared to 25. Sure, it might be a bit more then the DH car but when its costing that much does it really matter? I know of one that was purchase by another used car dealer that was then put up forsale as soon as he got it just to make a quick $5k. There are a few floating around on ebay right now being sold by other dealers. Sure, the Ford dealers might have sold most of them BUT they are already poping back up forsale.... and they only built 25 of them. Regarding the SSC, sure, it was expensive back in 1989 but so were all the Saleens. You can also say that all the current Saleen models are over priced aswell. Your convertible was around $60k when new... that is also overpriced. My convertible when new was around $60k which is also over priced. What about the S7.... overpriced????? Yes it is BUT the S7 is a completely different car from a modified mustang because basically we are now buying a $90k modified mustang that in 2 years will lose $40k of what it originally cost especially since they keep building high numbers of these cars. I really wish they would hold there value but they don't... we all know that. With the hard times we are having right now I think they are going the wrong direction with the Saleen brand. Coming up with another special edition is not what is needed. "Power in the Hands of a Few" That keeps becoming more and more true with the pricing they have since not everyone can afford a $90k mustang. We are now buying a mustang that has become an exotic car which I am not saying is a bad thing at all BUT since people can't afford what they could just a few years ago they need to really think about what is going on today and in the near future before the decide to bring out a new $90k special edition. IMO, they should be producing 200-250 SC cars, 50-100 E cars and then maybe 1 special edition model of 100 cars (like the PJ cars which alot of dealers still have on there lots BTW) BUT don't price it out of wack so there is enough buyers for them. Then you can throw in the mass produced Racecraft cars to fill in the gap for the lost Saleen production especially since I am sure they are making good gross profit on each of them they build. But like Dave said, thanks Jim for the pics! The public unveiling of the 2009 Dark Horse will take place at Mustangs at the Queen Mary - Featuring SaleenFest 2008 on Oct. 5, 2008. The Dark Horse was recenty shown to members of the press at a Willow Springs event. This will be the first chance that the public will see the car up close and personal. Dan Gurney & Parnelli Jones will be on hand, signing autographs. Other celebrities include Courtney Hansen and (son of Steve) Chad McQueen. The show is sold out, but free to spectators. You'll also get to meet the "new face of Saleen" VP Mark Patrzik. Find out directly from Saleen Management what is coming up for this revitalized company. Last edited by Dave; 09-28-2008 at 09:15 PM. Reason: Two bold headings.